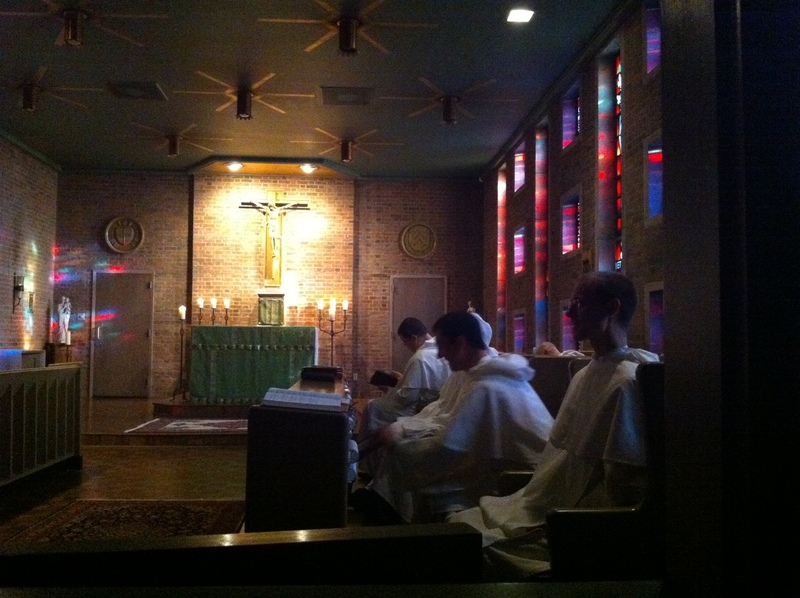 So, my son has been at the Novitiate for almost four months. He’s been in spiritual boot camp for almost 1/3 of a year; or, he’s almost 1/3 of the way through his intensive friar boot camp. He has a new name, Brother Peter Joseph. He has new clothes, for most of the time, his white habit and black copa (cape). He has 12 new brothers, and as I’ve now begun to get to know them….they are great guys. Now, I guess that’s no surprise, they would be, right? Well, by and large, they are. Which is a comfort to my mom’s heart too. It’s getting cold up there but I sent up his coat (and cookies). Brother Peter Joseph spends his days in prayer, study, and service, with time out for basketball and hikes and music as well. He is choir master, for now. Halfway through they switch jobs, and they might then make his new job master of the laundry…or maybe not… They have movie night, dvds from their library, every week. They have game night, I think. They walk into town for errands. He drives now and then; every week he has a day when his team of brothers works at an assisted living facility, doing whatever is needed to help out. They do a lot of manual labor, they have some big projects in process around the parish and priory. They laugh a lot, they are a funny bunch – and that makes me so so very glad too. 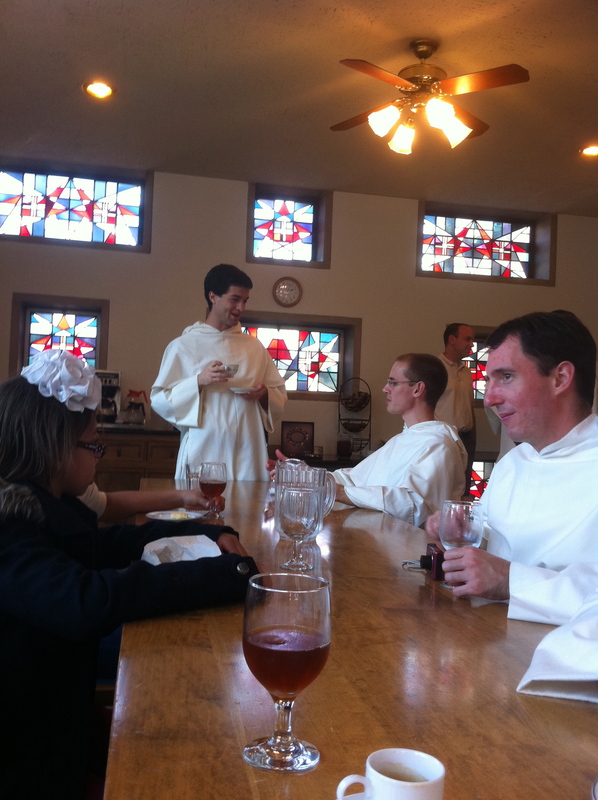 The brothers have class most days, but not the test/paper kind of class…more the deeper learning/study kind of class. It all sounds kind of calm and quiet and routine. And, in so many ways, it is, I think. But it is carefully crafted to be so, in order to detach from the noise and distraction of this loud busy world and go into the deep; to turn the heart and soul toward God and the ear to his voice. To listen, fully, finally, and really. But that, right there, is where the real rigor begins. I don’t know about you, but oy, for me to really QUIET, and listen…? That’s a workout. I am like a gabbling goose (I know, I know – evidently, right?!) and to actually STILL my body and mind…well it’s a JOB. It’s actually totally countercultural anymore, really, isn’t it? I think so. And that, the very rigor in that process, is why this novitiate year is hard. To come face to face with your attachments, distractions, little idols, irritations and indulgences and set them aside for something so much bigger that you can’t even wrap your head around it fully? That’s something kind of unfathomable to me. So, when my son says he’s “…really good. But it’s hard.” He means just that I think. It is a deep, but good difficulty. It’s time. It’s his time. 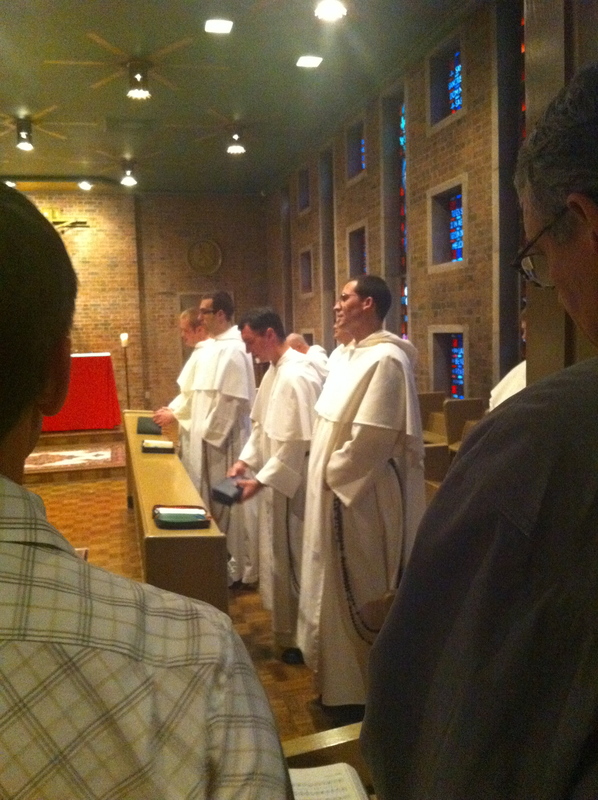 And he is approaching one of the hard seasons of the novitiate year. Not the most difficult; that would be Lent. But the next two holidays are big. Big changes, big adjustment…for us all. He will miss, for the first time and for onward, Thanksgiving and Christmas (and lent/Easter, etc) at home with his family. We will miss, for the first time and for onward, having him with us. Oh, it makes me tear up to even type it, dork that I am. And it’s not like I didn’t know…I KNEW, even last year, that it was the last. But, there it is. It is hard. For us all. But, even so, it is good. He says, “Please keep praying for me.” So, I ask you, any or all, to please keep my boy in your prayers; heck, keep all those young men in prayer. Because it’s a tough season ahead. Jolly, yes. Joyful, yes. And rich? Beyond description, I suspect. 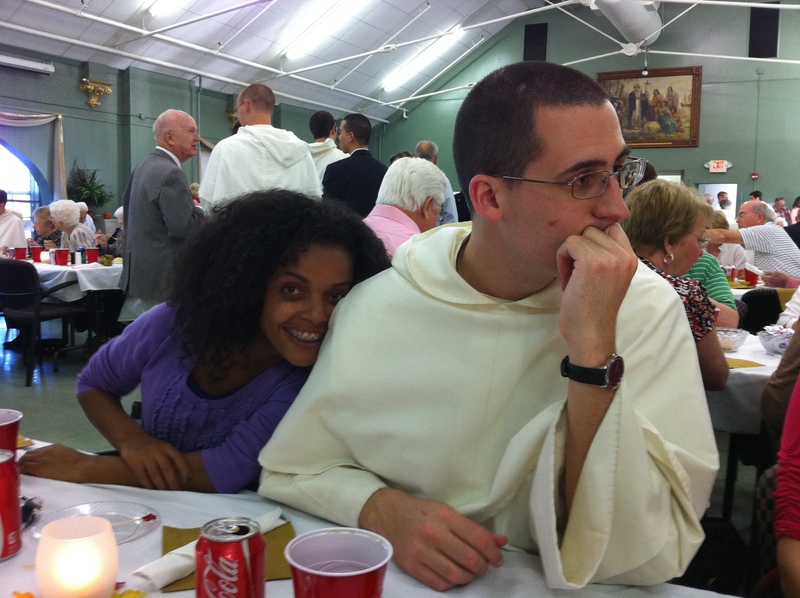 So, how is it going, that novitiate? It’s going really well. It’s going just like it’s supposed to. It’s hard. It’s rich, peaceful, bittersweet, lonely, irritating, surprising, funny…it’s good. It’s radical in the desire and the depth and the choosing of it all. And, I suspect, and hope and pray, that’s it’s radical in it’s accompanying (divine) light and goodness and joy. 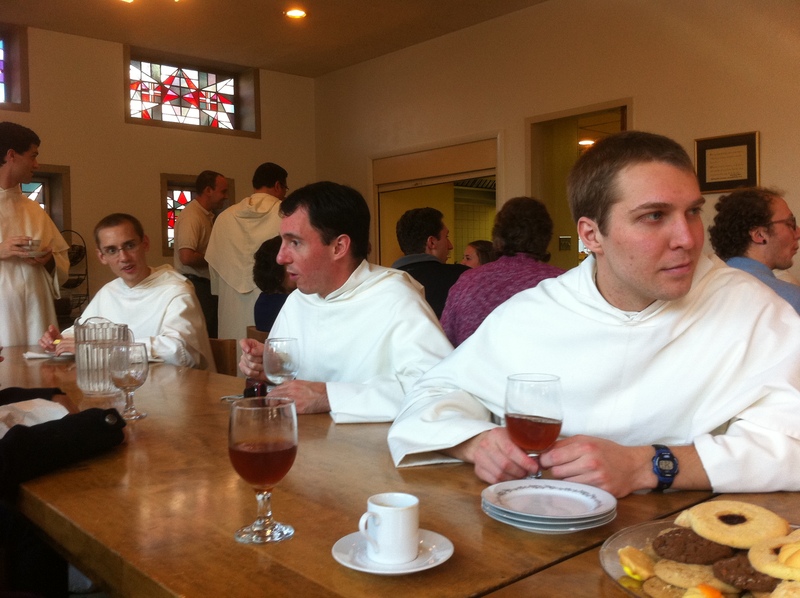 This entry was posted in boys, brother, catholic, chris, Dominicans, family and tagged Dominican friars, novititae, Province of St Joseph by coffeemom. Bookmark the permalink. Must be unusually emotions, today…this caught me. Maybe it was the picture of Tom with him. Prayers for all the boys.